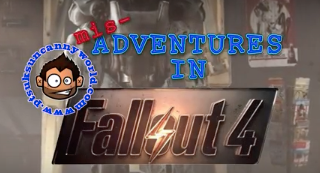 PTSuks Uncanny World: Video : Mis-Adventures In Fallout4!!! S01E03 - "Concord"
Video : Mis-Adventures In Fallout4!!! S01E03 - "Concord"
Latest video of my Mis-Adventures in the world of Fallout4! On the way to Concord, I run into a new and trusted friend, investigate a forbidden cave beneath a garage and then stumble into a fight amongst two rival faction in the middle of downtown!